Our first game is a well-known classic, but it was such a big and original thing when it was released, that it turned the world of gaming on a completely new track for a while. Released during the Christmas period of 1979, Atari's Adventure was very likely the first video game ever of the graphical action-adventure genre. It was created by Warren Robinett, who based the game loosely on Will Crowther's text adventure game Colossal Cave Adventure from 1976. According to the Wikipedia article, at the time of the game's creation Atari did not credit any of its authors for their work, so Robinett cleverly credited himself in a hidden message, which could only be found via a series of well hidden actions, mostly unconnected from the actual game. Effectively, Warren Robinett had coded one of the first, if not THE first, easter eggs in the history of computer and video games. Although Adventure has been unofficially converted for other computers by fans, the reasons mentioned above should be enough to include this game on the list. Already well covered by the Angry Video Game Nerd in 2010, this game series needs more mentions, because it really is one of the most original, not to mention rewarding action-adventure game series in the history of gaming. Unfortunately, the final part of the series never got released, so the gaming world really lost a true treasure in many senses. I will not even bother to talk about it any more than that, check out the review by AVGN, or better yet, play the three games yourself. 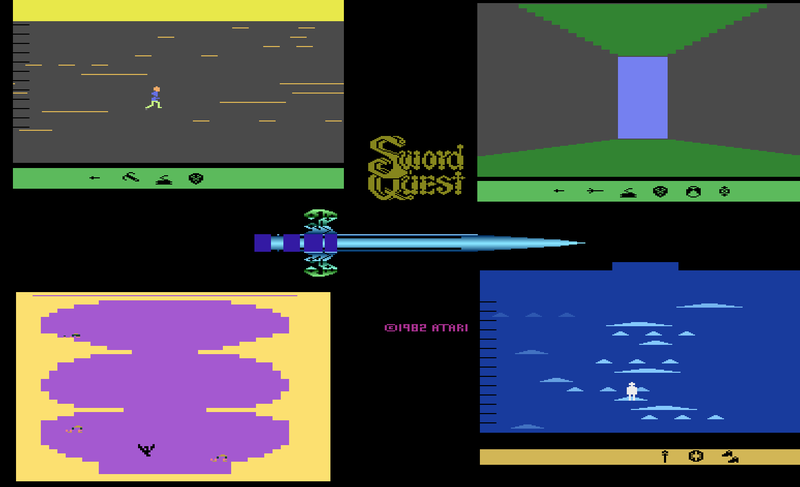 Atari 2600: the Swordquest series. Above: EarthWorld. Below left: FireWorld. Below right: WaterWorld. Also mentioned by the AVGN in his review of Indiana Jones games, Raiders of the Lost Ark needs no other reason for being mentioned here than the fact that it actually exists, because the Atari 2600 is the only platform, that a game based on the movie was ever released on. And being the first game based on the series of Indiana Jones movies is a priviledge of sorts that should be taken seriously. But do we, then? Because the graphics are so primitive, it's difficult to understand what is happening for the majority of time in the game. So, in order to make any sense of what you should be doing, you NEED the manual that the game box included. Or just download it from the internet. Once you get into it, it's not a bad game at all, just not a very intuitive one. Sure enough, more modern gamers will scoff at the idea of having to read a manual before heading into the game, but this is how it was back then. Even the simpler games required some reading in order to understand them, because the quality of graphics couldn't always allow for a more understandable gameplay. It would have been interesting to see a more instantly accessible version of Raiders of the Lost Ark on some other computer, such as the Amiga or PC, but no such luck. One of the rare Atari 2600 games that is actually properly rare, is also a rarity for the sake of being one of only four Atari Club games originally available exclusively through mail-order. Another reason for Quadrun for being a rare item is that it's one of only two Atari 2600 games to feature voice synthesis. So, what is the game like, anyway? It's a bit more difficult to describe than you would expect, but it basically is something of a shoot'em-up, but your weapon is a single energy ball that you need to catch again once you have shot it. The game features six types of enemies, all with a unique personality - much like each of the four Pac-Man's ghosts do, so you really need to think on how you attack. Quadrun's level layout is probably its biggest downfall, since you don't have all that much moving space, so it's certainly a difficult game, perhaps uselessly so. As it is, though, it's still one of the more desirable collector's items, because it's not a bad game, and only 10,000 cartridges were ever produced. Therefore, your best bet of ever getting to play this on real hardware is getting yourself some sort of mass storage device for the A2600 and download the rom file to play on it. Let's begin the VIC-20 section with an obscure little game, which is quite possibly the most difficult one of them to describe. I might as well say out front, that Mutant Herd has become my favourite VIC-20 game so far, and here's why. There are two phases in the game - keeping the mutants away from the powerhouse with your cross-lasers, and controlling a Mutant Slayer inside a burrow to explode it. Once you have sealed all the burrows, you will need to kill the Mutant Queen herself, after which you will proceed to the next level with new dangers. The only thing making this whole process a bit hectic and insane is that every time you blow up one of the burrows, your laser beams become more and more affected, and start gradually looking like swiss cheese. It is a fast-paced thinking man's action game with just enough variety in gameplay to make it appeal for a long time. A highly recommended VIC-exclusive, this one. Since this game only requires the smallest amount of additional memory available, it should come as not a very great surprise that Wacky Waiters doesn't have all that much going for it. 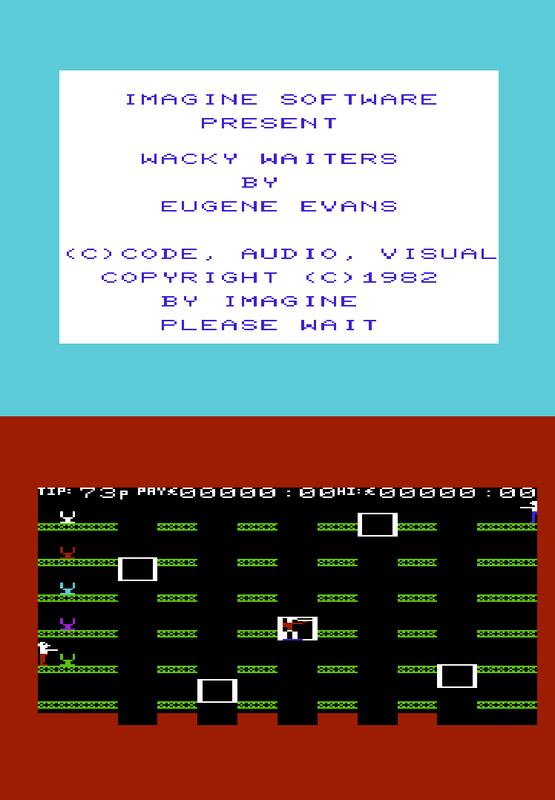 Being one of Imagine's first titles ever, Wacky Waiters certainly fits the era, if nothing else. You see, the game plays almost exactly like what you would expect from a Nintendo Game & Watch game: you control your waiter through a series of lifts from one end of the screen to the other, back and forth, carrying drinks to customers at the right end of the screen. What makes it only "almost" one, is that your waiter can move a few pixels between each lift, and the moving is sometimes slow, sometimes unresponsive. I haven't still completely figured out in what order you should do the tasks, but although the game looks as boring as you would ever think they get, it has almost that exact strange kind of charm that Game & Watch games do, that pull you in and keep you coming for that one more try. Wacky Waiters was only ever released for the VIC-20, and I can hardly imagine it being on any list for the most wanted conversions. As many of you might already know this one, it will come as no surprise to you as to why exactly am I including this on a list of unique games. Ultima, as a game series, is quite possibly the most important computerized role-playing game series ever, and so it had baffled some RPG gamers for years, why exactly was this one let to be released bearing the title. Of course, now we know better, but back in the 80's and 90's, when information was not that easily to be found, Escape from Mt. Drash was more of an obscure treasure to only read about. Now, it's more a sad relic unworthy of the title, but certainly valuable because of it's existence only on the VIC-20, and even there only having a relatively small print number. And this is what the game looks like. You have a team of unspecified beings (although they have names), whose only mission is to escape from Mt. Drash, which is basically a maze in a number of levels. You do, however, occasionally need to fight some goblins and other guards that make your escape slightly more tenuous, but that's all there is to it. Fight the guards, find the exit, escape. Not very unique, I grant you, but it is the only Ultima title that had this single release on the VIC-20. Collectors, rejoice. This might come as a surprise to some of you, but there was an actual third game in the series that started with the legendary Manic Miner. Jet Set Willy II doesn't count, as it was originally only a modification of the original JSW on the Amstrad, to exploit the larger amount of memory available. The Perils of Willy, released in 1984 (the same year as Jet Set Willy), was only ever released for the VIC-20 for some reason. The basic idea is pretty much the same as in Manic Miner: you collect certain objects from single-screen areas, and move on to the next level, although here, you don't have to enter the exit after collecting all the objects. There are some major differences, though. In Perils, Willy moves quite slowly in comparison, and his jumps are higher and much longer than in the other games. Understandably, there is a smaller variety of graphics in the game, but it does have some sounds - a very small extract of Led Zeppelin's "Stairway to Heaven" on an endless loop, much like Manic Miner had Edvard Grieg's "In the Hall of the Mountain King". Considering that Manic Miner requires 48k of RAM, fitting a game of basically the same mechanics into 21k is a rather nice effort. Considering that retrogaming is usually very much about your personal nostalgia trips, instead of searching for something new and interesting from the past, the Commodore 16 and Plus/4 computers are completely out from that lot in my case. Since most of the games catalogue are conversions from other computers, it has been difficult to get excited about looking for anything. Particularly as so far, I haven't been too impressed with either of these two computers' offerings. Since they usually are in one way or another coupled together, I decided to put them together here as well, and still, I have only been able to find the following games to make the list. Hopefully, someone will point out some other great C16 and Plus/4 exclusives in the comments. The first title for this section is an infuriatingly frustrating puzzle/strategy/action game called Oblido. Of course, that goes to say it's also incredibly addicting. But it's one of those games again, that just by looking at it, you can hardly tell at all what's going on, and what you should be doing in order to get anything done. So, the manual comes in handy again. "In the maze are 4 sets of 9 counters, each set a different colour. Jockey the counters through the maze to the right reception area. Whilst you are trying to do this sinners are escaping from the 'Sin Bin' and are out to stop you! Time is against you - bonus points are ticking away - frustration is building! Crush the sinners - zap the sinners - they must be stopped!" etc. etc. The biggest problem with the game is the amount of things to concentrate on simultaneously, and the unfair amount of time to accomplish everything. But that is precisely what gives Oblido that all too precious "one more go" factor. Graphically, this game feels the kind of game that would be somehow more comfortable on the Spectrum, but for some reason, it only ever appeared on the C16. Similarly to Mutant Herd on the VIC-20, this title has now become my current favourite from the C16 games library, but I wouldn't go so far as to urge you to buy a Commodore 16, or a Plus/4 for that matter, just to be able to play this game. Strangely titled Xzap is an arcade game in a very pure sense. However, it's a bit difficult to describe, which only makes it more interesting. The game looks initially like it could have been born from the mind of Jeff Minter, but the intro sequence tells you it was made by Mark Wirt. Granted, the game doesn't have any camels or sheep or other strangely out-of-place animals in it, but the gameplay somehow resembles Minter's Matrix. You control some sort of... thing, probably a space ship or something, and you shoot other peculiarly shaped creatures, and try not to hit anything other than the surrounding blue blocks. The most unique things in the game are the two bouncing timers, which spread into two force fields - one horizontal and one vertical, when the timer gets to zero. Of course, your mission is to shoot every moving thing, but the controls are slightly awkward so it's not an easy task. Although it has only gotten a 5.6 out of 10 at Plus/4 World, I think it's a very interesting piece of gaming, and well worth a look or two. Some of you might recognize the outlay of this game as being peculiarly familiar. It's because this is the only official sequel to (More Adventures of) Big Mac: the Mad Maintenance Man, released on C64 and C16. The original seems to have been just a bit more at home, or popular, on the C16, so Tony Kelly only wrote the sequel for the C16 - although it's very much compatible with the Plus/4 as well. This time, instead of featuring Big Mac himself in the leading role, the titular character is apparently a character that was "immortalised on the BBC TV's Late, Late Breakfast Show", at least according to the tape cover. I have no idea whether this has any basis on reality, but it makes little difference in this context anyhow. Just like Big Mac, Mr. Puniverse is a similarly constructed platformer, where your mission is to walk and jump all over a series of strange looking screens, and pick up 25 vitamin pills in order to win the game. It's not much, but it's a C16/+4 exclusive. UPDATE 8th of March, 2014: I originally added this one as a point of intrigue, mostly to remind myself occasionally that this game exists, because I thought it looked very interesting and unusual, particularly for a Plus/4 title. By the time of my posting this blog entry, I hadn't been able to get this one to work yet on my VICE emulator, which could well imply that either my VICE is well past it's "best before" date, or I would need a different emulator entirely to get to play this one. So, when I was working on another comparison that I had problems with on the Plus/4, I finally went and downloaded the latest version of YAPE to see if it helps. Well, the other problem couldn't be solved by that, but this one did. Ghost Town (USA) is a strange mixture of old Sierra adventure atmosphere, Atari 2600 aesthetics and some badly made independent DOS games, that somehow works to its advantage. Your mission is to examine all the derelict buildings of an old ghost town, pick up objects and confront the lingering ghosts that require some sort of offerings from you in order to make their peace and leave the town. It's a truly unique experience for a game of this age and platform, so I highly recommend everyone to take a closer look at it. You might not like it, but at least it's something completely different. Since there are so very few really exclusive games for the MSX computers, I'm afraid we're going to have to put up with some space shooters for this bit. But not to worry - Guardic from Compile is actually a very interesting one. Most of the action takes place on single areas of a map, which you will have to navigate through and kill waves after waves of enemies, but here's the trick: you can choose the game speed, the wave types and your preferred weapon option. Graphically, Guardic resembles more of Arkanoid and Galaxian put together than any normal shooter, which is a nice bonus to the already curious package. Also, fans of The Guardian Legend from the NES will be interested to know, had you not known it before, that this is it's prequel, and apparently only available on the MSX. Still more interestingly, Guardic was originally part of another series, of which The Guardian Legend isn't. All this makes the game all the more interesting, if not altogether that unique, but all in all, it's a curious title, that is only available for the MSX. Konami and MSX are two brands that will easily bring to mind some very good shoot'em-ups, so I think it's only natural that I include another one of them on the list. This time we take a look at one for the MSX2, which is an already considerably more powerful machine than the first MSX, and so the games are easily more impressive than anything on the first generation MSX. Space Manbow is no exception - in fact, it's even a bit better than you would expect. All the graphics, music and gameplay technicalities would feel at home on the SNES, but what's actually the most interesting bit here is the variety of boss enemies, which are very impressive and imaginative. I have to admit to not being much of a fan of space shooters, because of the overabundance of them, but this is easily one of the most playable representers of the genre. Too bad, really, that it's only available on the MSX2 machines, and it's rather hard to come by these days. Another hard to come by title for the MSX2 is this platforming action-RPG, which could very well be another heavy source of inspiration for the 2005 indie hit, La-Mulana. Because Usas was only released in Japan, it had remained unknown for a much too great part of the world for a long time, until the age of emulation, of course. Because the original King's Valley game was released for the MS-DOS as well as the MSX, and has been more recently converted for the ZX Spectrum, you can hardly call it a unique MSX experience, even if it is a very good one. The sequel, on the other hand, is an MSX exclusive. This one was released for both MSX1 and MSX2, with some minor changes to music and graphics on the MSX2. King's Valley II is more of a puzzle game than the original, which plays somewhat akin to Bubble Bobble, Lode Runner and PP Hammer put together. A strange combination, that has been managed to get to work rather well. The game comes with a built-in level editor, so the amount of time to be spent with this can be considerable. Highly recommended. This is the bit I am the least prepared to write, and I'm quite certain this will one end up similarly as my Colecovision section last time, but so far, I have been unable to find any other releases for these Intellivision titles. Hopefully, they are correct. It's unfortunate that they have very little to recommend themselves in gameplay, but let's take a look, and see if anyone can point out some obscure conversions on Sord M5 or Sharp MZ-2500 or some other more unknown platform. Intellivision games' cover arts are probably my favourite parts of the games, which make it difficult to judge whether the games are any good or not, because most of them have a similar style. Most particularly the ones released by Mattel themselves. Triple Action is our earliest example of what should hopefully be an Intellivision exclusive title, and similarly to Colecovision's Brain Strainers, the game cartridge contains more than one game - this time there are three, as the title would suggest. All of these three games are head-to-head two-player games in some particular style, which makes it almost a copy of Atari's Combat, but has some difference to the games. Game number one is certainly copied from Combat, and is called Battle Tanks. I would suppose that one needs no other explanation, but for those who don't know for some reason, you and your combatant control your tanks and try to shoot your enemy as many times as possible within a limited amount of time. Game number two is the different one, and it's called Racing Cars... they couldn't have come up with any more imaginative names back then? Anyway, your mission is to pass more cars than your combatant within a time limit, but you need to look out for cars coming towards you from the front on the other lane. Atari's Combat has a Jet level instead, which is basically a slight modification on the third level, which is Biplanes, in both cases. In the Intellivision version of the level, however, you need to additionally look out for a hot-air balloon. And therein lies the reason why I chose this one to represent this game here. It's a far-fetched one, but it has some significance to my gaming history, and strangely, Intellivision had very little to do with it. I originally played this Biplanes level on Amiga with a few friends, although I can't remember anymore where had they found it, but it was a public domain release, and the I remember the title screen mentioned it was a remake of the Intellivision Biplanes game. But the thing is, the Amiga version was infinitely more playable due to the more comfortable controls. Anyway, Triple Action could be called a blatant rip-off of Atari's Combat, but it has one different level, and it's only available in that precise form on this precise machine. I think. This second title is more of an obscurity in the Intellivision library, for two reasons. It's a combat flight simulator for one, which should be uncomfortable already considering the controls - but instead, they have worked it out surprisingly well. Secondly, the game has speech, and there were only five games featuring voice synthesis originally released for the Intellivision. B-17 Bomber looks like an interesting game for all it's worth, but I'm not a big fan of flight simulators, specifically when I have no proper controller at hand, nor a real machine to play it on. Besides, I believe that simulators are the exact sort of game genre that need properly good graphics in order to get anything out of them. If you want to take a look at how the game plays when someone who sort of knows what he is doing plays it, take a look at this video. My good friend Bob, who has commented on my blog a few times, told me about the first AD&D game some time ago, and although I don't consider myself as a fan of the AD&D world, I took an interest to the game. There are some other computer games related to the series that I do enjoy every now and then, such as the first two Eye of the Beholder games, Warriors of the Eternal Sun, and I used to like Dungeon Hack, but forgot it was part of the AD&D series. Anyhow, I took a look at Cloudy Mountain on an emulator, didn't really understand how to play it properly, and forgot about it for a while, until now. I knew there was another AD&D game for the Intellivision, because I came across it while looking for Cloudy Mountain following Bob's recommendation. I found out that the sequel, Treasure of Tarmin, was most likely the first RPG ever completely played from a first-person view. I was battling myself for a long time on whether I should include only the first AD&D game or the second one, because both have a reason or two to be included on the list. I chose both in the end. Originally just titled "Advanced Dungeons & Dragons", the first Intellivision AD&D game was also the first AD&D video game licenced by TSR Inc. Due to the memory demands of a role-playing game, it was also the first Intellivision game cartridge to use more than 4k of ROM. The game feels at first like an Ultima clone, but it turns into a strange version of Rogue with randomly generated mazes and randomly appearing treasures, traps and enemies, but it looks really strange and plays likewise. When "Treasure of Tarmin" came out a year later, the first game was re-released with the added title "Cloudy Mountain", so as to avoid any confusion. This newer game had very little in common with the earlier one, other than having the same licence, but you can see most of the differences in the screenshots above. There is one thing that I'm not sure about though: this game was released for the Mattel Aquarius as well, but considering it's a machine from the same company, I will let it pass this time (if for no other reason than the fact that it's really difficult to find any exclusive games for these sorts of consoles). It would have been a bit different, had it been released on the Atari 2600, as it was supposed to. Fortunately - or unfortunately for the A2600 owners - Mattel Electronics closed their doors before the game was released. It was finished, but you still cannot find it anywhere, so the Intellivision is easily your best bet to get to play it. Perhaps neither of these games is really anything unique in gameplay, but they are some of the earliest examples of computerized AD&D games, and they are only available on Mattel consoles. Probably the most impressive Intellivision title I have come across so far, Hover Force is an unusually graphical feast of shooting action, particularly as it is the only game to ever make use of the 3D Chalk toy glasses. You play as the pilot of a combat helicopter, and your mission is to eliminate terrorists and minimize the damage from their attacks by using laser cannons and water cannons, both equipped with a finite amount of ammunition. Your missions start at an island base near the city, and you can repair, refuel and re-arm your copter at the base twice during the missions. If you make a third attempt at landing on the base, you will crash. Hover Force was originally developed by Mattel Electronics, but after the company was shut down, INTV Corporation acquired their assets and finished the game in their own way. If there is one game to recommend to anyone uninitiated with the Intellivision, it is this one. This time the Sega section starts with this peculiar action-adventure for the Master System. I had not previously heard of Cyborg Hunter, but it was one of the more recommended SMS-exclusive titles on the forums I went to investigate. My first impressions of this game were very good, and if I were to compare it to any other games from other platforms, I couldn't make a straight connection anywhere. It feels like a simplified version of Metroid and Mega Man put together, but it has something completely unique to it as well. Something very similar to what Project Firestart on the C64 has. Also, the game has a radar for seeing that something is coming up ahead at you, but it doesn't really help you as much as it could. But it's a game based on an anime series called Choonsenshi Borgman, which I have never seen, so I can't tell whether it's any good at representing the series. As a game, it might not be exactly the most interesting to play, but it has enough things going for it to be included here. For starters, this strange puzzler was the first game that Tengen ever developed for Sega's only properly sole-purpose handheld console - the Game Gear, which is the only platform the game ever appeared on. Secondly, it's probably one of the weirdest puzzle games ever, because it takes the form of a side-view platforming game, and looks curiously similar to Super Mario Bros. So, the gameplay centers on punching blocks, going through doors and climbing ladders, while avoiding enemies and spikes. Destroying blocks can drop other blocks above them, so the level layouts will change during gameplay. In each level, you must reach the princess in a specified amount of steps or less, and in order to complete the game properly, you must do so in all of the 100 levels. Popils also has a map editor, which allows the player to create new puzzles, which is always a good plus. Another highly recommended curiosity, and well worth owning, if you happen to have a Game Gear in your possession already. One of my favourite findings so far while writing the Unique Games series, has been this little known game from Namco. I was going through a Wikipedia list of exclusive Sega Genesis games, when my eyes hit this title, being the only one under the letter 'Q'. The title itself didn't raise any hopes of finding a particularly interesting game behind it, but - oh the joy of being wrong in your presumptions for a change. 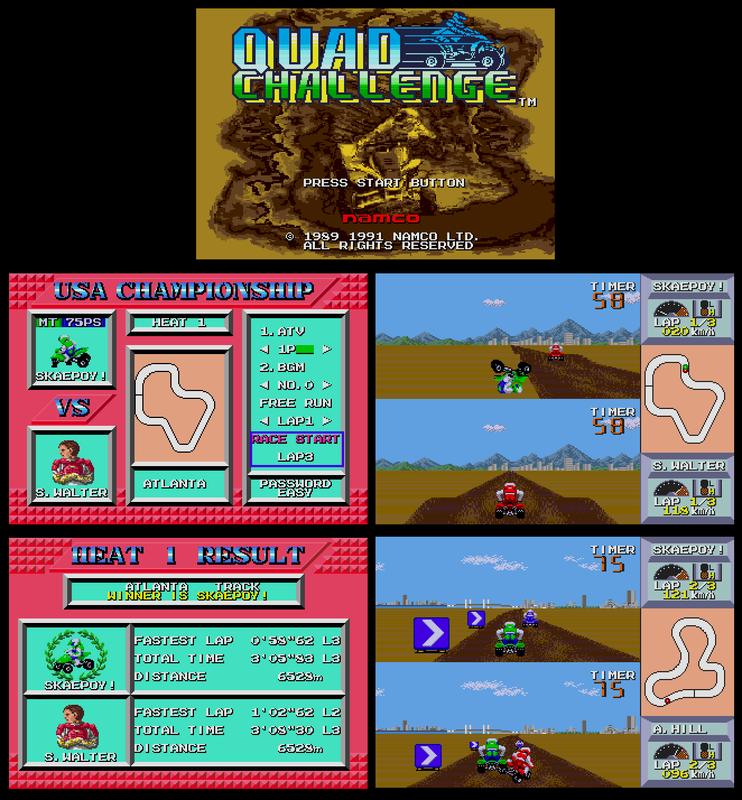 Quad Challenge plays much like a cross between Excitebike and Pole Position, only this time, you drive quadbikes. This particular genre has never been all that much of interest to a bigger audience, so the lack of quad-based games is understandable, but this one here is not just one of the first off-road racing games for a console system; this is quite possibly the first solely ATV-based racer for a console ever, and in 3D behind-view as well. I should think it has earned its place here. UPDATE - April 25. 2014: Wrong again, but not too much. Actually, this game is the only home conversion of an earlier arcade game by Namco called Four Trax, which was released in 1989. I was going to include a rather interesting fishing game called King Salmon on the final Sega spot here, but then I noticed this little questionable treasure. Most of the more hard-core gamers I know of are aware of the original NES game, but I had never heard of it having a sequel, much less a good number of them. All of the Blaster Master games were released on different consoles (GameBoy, GameBoy Color, Playstation and WiiWare in addition to this one), but I chose this title here to point out the existence of these less heard-of titles in the series for those who enjoyed the original game, and much like myself, never knew of the other games. To be sure, the sequels pale compared to the original, particularly this one, as it is only more of a straight platformer instead of a more open-ended, more strategic platform adventure. A lot of this can be explained by this sequel not having the same development team as the original game, but it is a real sequel, published by the same publisher, and featuring the same title and characters along with the basic blocks of the gameplay. I don't know if I should recommend this particular title, but I should recommend everyone to take a more thorough look at the series, instead of just sticking to the original. I wanted to include a section for DOS games, because getting a proper PC was my next step in computing after the Commodore 64. Unfortunately, most of the IBM-PC compatible games of old are ridiculously hard to browse through because of the sheer amount of games, and most of them are conversions from other machines anyway, because the IBM-PC compatibles were not exactly considered to be gaming platforms until the early 1990's. So, I decided to take the easy way out here, and just do some games from my DOS years. One of my earliest connections to DOS gaming is this peculiar title from Dynamix. I remember a friend of mine was intensely addicted to this game, and I had no idea what the attraction was then. Sure, it's an adventure RPG with strategic grid-based battle scenes, but it didn't really appeal to me. Now, though, I can understand it, but now it's kind of too little, too late. And I really hate the turn-based battling system. As it is, it's still a very singular setup of gameplay elements, combined in an even more singular way than you would expect. Back in 1993, being virtually a free-roaming first-person RPG was a huge deal. As far as I can remember, only the two Ultima Underworld games had managed to represent that genre gracefully. If you want to take a look at how things were back then, grab a copy at GOG.com, and take some time off to immerse yourself into the world of Krondor. As I was just talking of free-roaming gameplay, how about this beast, then? 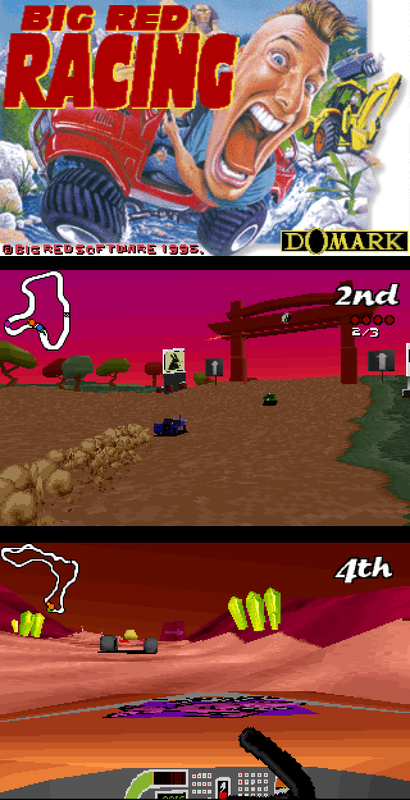 Big Red Racing from Domark presented to me and some of my friends an immense departure from all the other racing games up to that point, and due to the experience we had with the shareware version of it (one track only), I had to go and buy it. Later on, I think I sold it to one of the friends who appreciated the game the most, but I still think it was a unique experience back then, and well worth the purchase. And why? The 3D graphics were ugly already back then. The sounds were not really pleasing for the ears, but it had a funny (if ultimately repetitive) commentary, and a rocking soundtrack. Even the playability was mostly awkward - you would feel the vehicles turned with a slight lag, if you had a third person view, and if you tried to drive from an inside-view, you would mostly be looking at the floor, because the "realistic" camera was so awkward. For us kids, Big Red Racing had three things to make it worth playing: a very nice variation of levels, and certain types of terrains had certain types of vehicles to choose from, plus the freedom of driving outside of the tracks and finding hidden bits that you might be able to do some crazy stunts on. It certainly took us a few good months to exhaust the game's offerings. Strangely, considering the games libraries on the consoles back then, you will not find one conversion of Big Red Racing on any of them, although a vast pile of other horridity are easily available. After Gremlin Graphics changed its name to Gremlin Interactive in 1994, the company started concentrating more on the 16-bit market, which is natural, but they also lost a bit of their original status. That's not to say, they didn't release any brilliant games - that they certainly did, but not with such great momentum as they had on the 8-bits. 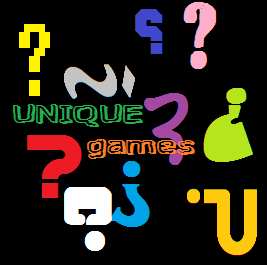 Titles such as Zool, the Lotus series, Fatal Racing (a.k.a. Whiplash) and Loaded come to mind, but none of the games reminded me of their old times - spiritually - as much as Normality, a cartoony first person adventure in an unusual sci-fi setting. While the game plays mostly like a cross between Under A Killing Moon, Ultima Underworld and Maniac Mansion, which is already quite a strangely mixed bag, it's the visual and comical side of the game that makes it feel like the final properly Gremlinesque release. Probably my favourite beat'em-up game ever, One Must Fall started out as a seemingly normal human-vs-human type of a match fighting title, but the full release was happily something quite different. You would play as the owner of a huge robot, whose mission is to win cage fights against other robots and their owners. But as you might have guessed, it's not like Robot Wars on the telly, not even near. It's basically a very similar concept to games like Street Fighter and Mortal Kombat, but with very little emphasis on special projectile weapons or anything like that. You do have some small specials, but are of little use in a match, because the game speed is tremendously quick, so you can't really stay low and think about your moves for more than a quarter of a second. Which is exactly why I love this game. I hate learning gigantic lists of button combinations for special movements, so games like Tekken are almost completely out of my league. You really need to be quick about doing even the most basic of movements, but when you master the few specials you have at hand, and be quick about it, you still have quite a bit of work ahead of you to get to the top. One Must Fall: 2097 isn't about losing completely when you lose a match - it's just a setback on your way up, nor is it about winning as such. It's one of the first games I can think of that play more like a modern "achievement got!" type of an affair than a classic "complete it and you're done" game. When you win a match, you get some money to buy upgrades for your robot. If you lose a match, you might have to ditch an upgrade in order to continue, but at least you will be able to get ahead relatively easily. All that combined makes it a good waste of a couple of days at your keyboard. And that's it for the third part in this series. The next time I will be getting back to more Unique Games, I will concentrate more on the most familiar machines, but not to worry, the series will continue on as long as I can think of more interesting gaming platforms to sift through. For now, it looks like I have exhausted some of the machines' exclusive games lists already, at least from a point of any sort of interest... but we shall see what the future brings along. Or perhaps more precisely, the present. Thanks for reading again, see you next time with something more regular! Comments, suggestions and corrections are as welcome as ever!